If you're looking for videos and photos, I do most of those over on YouTube and Instagram. WHAT IS THE LAST LINE OF DEFENSE? The Last Line of Defense (LLOD) started when I was beginning to post random gun-related content online (on Instagram). I'd post videos of my training sessions, put some music on it, and upload it for the world to see (before it was cool, seriously though). I started gaining a following, and more and more people were asking me questions, advice, for tips and feedback. Being that Instagram had limited functionality, I decided to create a YouTube channel giving advice to new concealed carriers - and it's evolved into much more since then. I've become a gear-reviewer, product-tester, advice-giver, and all around rambler. Making videos is only part of the equation though... 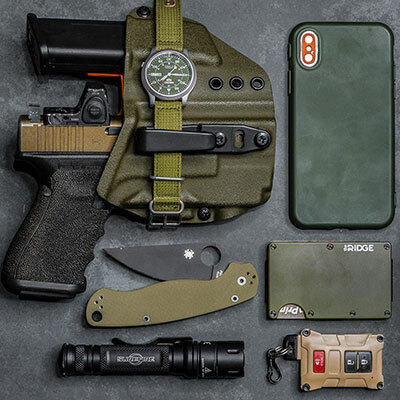 I'd like to be able to outfit your entire EDC with better, more well-thought-out solutions to your everyday needs. Stay tuned for more clever products. I've been making kydex holsters for myself for years - it came out of frustration for the horrible designs out there, that just didn't really seem to work well - I know you feel me on that. I spent countless hours refining my designs until I created a perfect (for me) blend of comfort and concealability. People took notice of my personal holsters and started asking if they could buy their own LLOD holster, and that's when I decided to start the manufacturing side of Last Line of Defense. Since then I've equipped thousands of gun guys with a better, more comfortable way to carry their concealed-carry gun, every single day. I've been told by hundreds of satisfied customers that the LLOD holster is the best, and most comfortable holster they've ever owned. If you're looking for a comfortable and effective way to carry, I'd love to help! 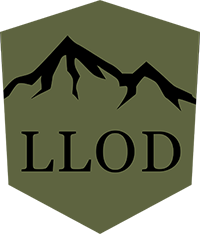 Whether you're looking for a LLOD Holster, or some type of LLOD Swag, hopefully you'll find the goods here. Though this site is new, and selling other things online is new to me as well - I already have some really cool gear in the works with some solid companies. I'll be working to get stuff up on the site to cater to everything that will help you be the best first and Last Line of Defense. Curious about anything else, let's chat. Literally hundreds of people have emailed me with sentiments mirroring the select few below. I put it on as soon as I got home and for the past few days I have been wearing it while walking, driving, bending over, sitting and practicing my draw and dry fire. I got to tell you its everything you said it is and more. It’s one thing to see it on your videos and in the pictures, but to get your hands on your very own and put it on, holster up your pistol and mag and feel how it fits and moves with you. That’s when I realized I had taken my “ Last Line of Defense “ to a whole new level, Thanks to You. Your concept in design is well thought out and it works great. The quality of material is superb, and the craftsmanship is outstanding. This is a great holster and I am very pleased. So I would like to start out with the fact that it is with out the doubt the most comfortable holster I have ever used. The construction is solid and I have no fears of a ND due to a holster malfunction. The gun and mag are secure even with a loose tension. Having the single belt clip makes it move with your body when walking. Making stairs, sitting, bending over no problem at all. ... Drawing from the holster is a breeze. It is easy to practice and grow confidence with the draw stroke. I have found that carrying the holster with the belt clip directly at my 12:00 is the most comfortable. Thank you Mike the holster is great and I can't think of any cons to it at all. Nice work on the holster, it just works. It is used every day, I am an active person and the holster accommodates this well. I love the product and recommend it to all my friends. All I can say is perfect! I couldn't be more pleased. Thank you. I have a Bravo Concealment aiwb for my Colt 1911. The quality and finish of yours is far superior. Having the one clip is lot easier and quicker taking it off than two. I don't think I give up any security/retention with the one clip. Another big plus is not having the hassle and time to put the mag holster on my belt. Any activity including driving I forget I have it on, it's that comfortable. Thanks again, will highly recommend. I've had the holster over two weeks now. I love it and have been carrying a lot more often than I used to simply by finally having a holster that is comfortable in every single way. Got the holster today! To quote McDonalds, "I'm loving it!!!" Your mag cradle/holster "V" design is very unique and comfortable. Even though I have a big stomach, I'm able to wear the holster very comfortably especially when I'm in the seated position! The quality of the holster is flawless and looks very professional! Based on the edges of the kydex, the shooters comfort was truly kept in mind when making this holster. I love it how the kydex wraps around the trigger guard. I will definitely order one for my Glock! I had my doubts about carrying appendix style but after a few hours of wearing your holster, those doubts are not a factor anymore. First and foremost I have to say thank you! Thank you for the excellent customer service, thank you for the tips and input you gave with this holster but most of all thank you for a superbly made and thought out product. The holster is great! Draws smooth, the mag is in just the right place and the cut makes it astonishingly comfortable. The curve of the holster works really well with the body and keeps the grip of the pistol tucked while still keeping it easily accessible. The backup magazine rides at just the right angle and sits low enough that running an extended base plate or a G17 mag doesn't put the height of the mag well over the top of the pistol. I recently took a road trip to Colorado, 15 hours each direction and wore the holster the entire time. I can't say enough good things about this product. I got the holster. Holy crap!! It's perfect!!! Thank you so much. Holster is the best I've ever used, and out maybe 6-7 different iwb holsters it's still number 1...!! Received the holsters, and I have to tell you they are fantastic! I am not one to offhandedly offer praise or for that matter feedback of any kind, but...as I had imagined when I saw your design, they suit me and that is saying something. I have a considerable collection of holsters and have never got hands on with any of them that just made sense, both from a comfort and practicality view point from go. You really have a fine product. I'm sure to be a repeat customer. After carrying it almost every day I can say that I love it, it is the most comfortable and concealable holster I have ever used. I'm so glad I ordered it from you. I plan on in the future contacting you for another holster down the line. Thank you for all the help and the time you put into it. It has allowed me to carry every day and not worry about discomfort and printing. Just tried on my new AIWB,...Now I'm OFFICIALLY spoiled! Can't imagine using ANY other system to protect myself & the family when out & about. Thanks for a rad product Mike! Most importantly thanks for reflecting your passion for Jesus in a way that's relatable and relevant to viewers of all ages. You're a good witness dude,....kinda like Twenty One Pilots,....when fans "find out" you're a Christian, rather than being told, it's way more impactful. I wanted to carry appendix as I had tried every other position and have mountains full of "not quite good enough" holsters. So yeah, I bought your holster and bought a G43 to go with it. 5 months later it has been my true EDC. I can only think of a handful of times I haven't worn it - mostly if I had to dress up for work. Love the holster and I'm actually even starting to like the Glock a bit too...don't tell the others. Your holster is very comfortable and I don't have to change my pant size or clothing to wear it. It just fit into my wardrobe. I think that is what makes a major difference in conceal carry. Hi Mike! I just wanted to say that I have been using your holster for almost one year and it has held up very nicely! I carry my G19 pretty much every day I am off from duty and its very comfortable. Most family and friends do not even know that I conceal carry until they come in for a hug. Hey Mike, thanks again for my Glock 43 AIWB holster. It has been absolutely stellar. Great craftsmanship, attention to detail, and mostly importantly comfortable. It just works flawlessly. Hands down the best holster I have ever tried. I don't carry all that often because I haven't found the right holster, but yours just took the cake. It blows the Crossbreed and Alienware types out of the water. I will now be inclined to carry more often which I am very happy about. My G17 feels just as secure against the body and concealable as my G19 and I love that. Having that extra mag in the same spot feels secure and balanced. Pretty much convinced this is the best way to carry. I even find that sitting down is comfortable with this holster (I'm kinda lanky so maybe that helps). The one clip method is the way to go. Love it, 10/10 would buy again. I'll be recommending it to my friends and family. I absolutely love the new holster! This has made edc so much more comfortable, and has made it easy to always carry with an extra mag at any occasion.